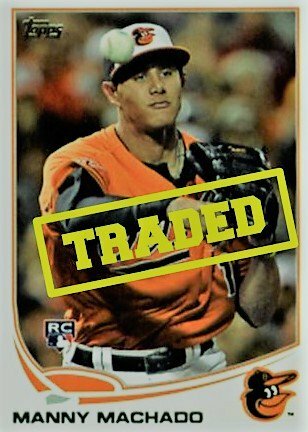 Machado Trade a Huge Risk But Is He That Much of a Difference Maker? The chatter is starting to pick up about the Cubs possibly acquiring shortstop Manny Machado from the Baltimore Orioles. The soon-to-be-free agent could command as much as $300 million this winter. The cost to acquire him this summer could be substantial but it could also be worth it. As we’ve seen in the past, flags do fly forever. But would a trade for Machado be enough to help the Cubs win a second title in 3 years? Currently, he’s hitting .347 with 14 HR, 42 RBI, an OPS of 1.093, and a WAR of 2.3 already. Clearly, this is the best year of his career. His average year includes 30+ HRs, 90+ RBI, and an average just above .280. Those are very good numbers that would slide into any lineup. Add in the fact that he has the best arm of anyone in an infield in the majors and you have quite the all-around player Theo covets. If the Cubs were to acquire Machado in the next six weeks, it would cost at least a minimum of four players. And of those four, it’s going to cost at least two of the Cubs’ current young position players in the majors. The Orioles are said to also be seeking younger pitching in the trade. There are few issues that I can see with the Cubs acquiring Manny Machado. 1. He is going to test free agency. The Cubs would have to give up a lot to get him and it’s an all or nothing outcome. They are not guaranteed a World Series title with Machado nor are they guaranteed to sign him to a long-term deal . He is going to make a boatload of money this off-season with or without the Cubs. If Machado does not sign up to be a Cub long-term, and you lose Addison Russell, you could slide Baez over to the shortstop position. That then creates a hole at second. The Cubs have lots of guys who could fill-in in that spot like David Bote, possibly Chesny Young, but most likely the opening creates an everyday position for Mr. Bounce House, Tommy La Stella. However, that’s quite a dropoff in talent on offense and defense. If I were the Orioles, I would ask for Russell and either Schwarber or Happ and 2 to 3 top pitchers in the minors that are close. The Orioles have every right to ask for the moon and they are going to get it from someone. Otherwise, all the O’s are left with is a draft pick and they can get a lot more than that in a trade. Ultimately, if the Cubs do trade for Machado, it’s seriously weakens the bench beyond this year. Right now, no prospect is going to be needed at the major-league level at least until after 2019 when Ben Zobrist moves on. As for pitchers, no pitcher is foreseen to be needed for a while unless Darvish opts at the end of the 2019 season. The Cubs don’t have a really big need to rush anybody currently in the minors to the major leagues. Still, when your farm system is thin, you would like to keep what assets you do have in case of injury later in the season, whether it is on the pitching side of things or a position player. There are no guarantees with prospects and there are no guarantees with Machado, either. The only thing for sure is you get a top 10 player in the game for three to four months and lose several others for what would amount to 19-21 years of service. That’s a pretty prohibitive cost. He’s a spectacular talent, but is he the guy that pushes them to their second title under Theo? That’s the essential question the Cubs need to ask. IF Machado was a pitching ace at the top of the rotation signed beyond this year, Theo would make such a trade in a heartbeat. But for a SS/3B rental, I doubt if Theo pulls the trigger.